Sato-san’s hospital bed is wedged diagonally across his living room, relics of regular life pushed to the perimeter. For four years the retired accountant traveled back and forth to a Tokyo hospital for outpatient chemo. Then last July, with the cancer still progressing, he and his wife decided it was time to stop treatment. At the age of 74, Sato-san settled in for his final stages in the heart of his home—the altar to his ancestors to his left, oxygen machine to his right—secure in the knowledge that the Matsubara Urban Clinic’s home-care medical team would be nearby. On a Monday afternoon draped in mid-October grays, Dr. Komei Umeda and a nurse make the 20-minute drive from the clinic in Tokyo’s western Setagaya ward. They walk up the stone path, under a carefully tended canopy of grapevines, bow deeply to Mrs. Sato, and step out of their shoes inside the doorway. Each takes a seat on either side of the bed. As the nurse unfolds a laptop, Dr. Umeda closes his hand around the patient’s and leans in, all tenderness and warmth. “You’re looking better, Sato-san. It’s good to see you,” he says. Sitting up in bed in his blue pajamas, Sato-san brightens to the company and the conversation. Mrs. Sato reappears with a lacquer tray, teacups rattling on their china saucers. Dr. Umeda, Matsubara’s medical director and a former surgeon, asks how she is faring. They take it day by day, she says. The best days are those when Dr. Umeda visits. Sato-san’s right lung has failed; morphine helps ease the pain, but it’s hard not to worry as the weekend nears. The clinic is always a phone call away, Dr. Umeda reassures them. Matsubara is one of eight clinics operated by the nonprofit Platanus Medical Corporation, of which Kanoko Oishi (MBA 1988) is cofounder and COO. She is also the founding CEO of Mediva, the company’s consulting arm. Platanus clinics share overnight resources and electronic medical records, so their combined 2,500 at-home palliative care patients always have a direct line to doctors and specialists. The Matsubara clinic also has 18 beds for in-patient services, an option that Sato-san has exercised for one week each month since July, mainly to ease the burden of his care on his wife. Dr. Umeda and the nurse eventually set a date for their next visit and step back into their shoes and out the door. It may sound like a throwback way of delivering care, but paired with a few critical 21st-century upgrades—technology-enabled efficiency and patient-centered design—this community-based care model may represent one of Japan’s best hopes for the future. The country is in a uniquely tight spot: Its elderly population is increasing faster than any other nation in history, while its birthrate is shrinking. That double whammy is reducing both the workforce to care for the elderly and the tax base to support its universal health insurance program. It’s a health care crisis wrapped in an existential quandary. Oishi had watched it all unfold as she built a career as a partner in McKinsey’s consumer goods practice in Tokyo—an almost ideal match for the sort of person who can’t not solve problems. Where some people solve crossword puzzles for fun, Oishi makes a sport of untangling lines. If she visits a noodle shop with an unnecessarily long wait, for example, she’ll reengineer the process in her mind: move the food there, put one employee here instead of two to reduce the line by half. “I’m pretty sure the owner would not appreciate that, so I keep quiet,” she admits. But the near collapse of the country’s health care system proved to be a problem that Oishi could not ignore; Platanus and Mediva represent her response. Nineteen years in, they have engineered a complete rethinking of health care offerings, which reach more than 100,000 patients in out-patient clinics every year; another 30,000 visit the company’s elderly day care facilities; and 2,500 people now have the ability to stay home at the end of life like Sato-san, instead of resorting to an overcrowded and more expensive hospital setting. Desperate for solutions and seeing the success of these new models, the Japanese government is building on communitybased care models across the country—as are foreign governments, from Myanmar to Saudi Arabia. Japan’s demographic time bomb is a bittersweet result of its robust recovery after World War II. Within two generations, the country catapulted from a state of ruin to the second-strongest economy in the world. Fed a steady diet of enterprising ethos and healthy foods, the population grew—and grew older. 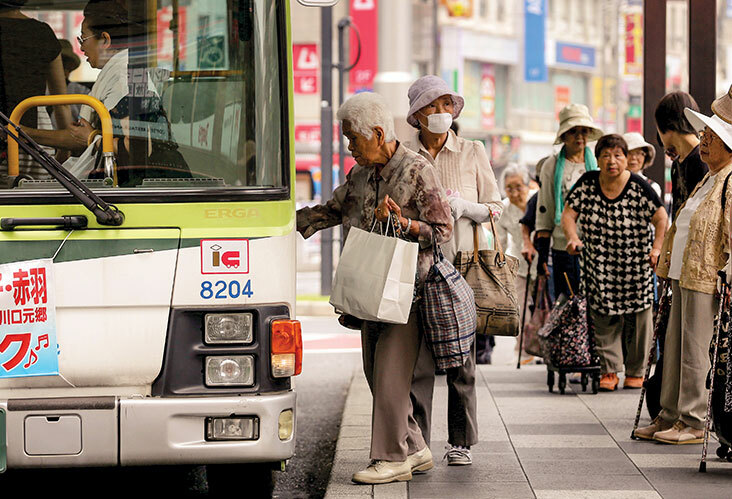 At 84, Japan’s life expectancy is now the longest in the world. About 36 million people, or 28 percent of the population, are over the age of 65 (compared to 15 percent in the United States). And now, sadly, that whole regenerative process is reversing itself. Already the country registers 400,000 more deaths than births every year. Most of those deaths—about 80 percent, according to data from the Ministry of Health, Labour and Welfare—take place in hospitals, exerting tremendous pressure on the country’s health care spending. Plus, hospitals have been plagued with problems, as Oishi explains over a pot of chrysanthemum tea in an apartment building in the western Tokyo suburb of Yoga, where Mediva occupies several units as office space. The government is reducing the number of hospitals, and without an appointment system, waiting rooms are overcrowded with flu sufferers and cancer patients alike. Doctors feel the pinch of wave after wave of government-imposed budget constraints, such as the decision to freeze the number of hospital beds in spite of the increasing percentage of aging patients. For physicians, the demands continue to rise but with fewer resources available to address them—or even the training to keep up with technology. Oishi discovered this firsthand toward the end of her pregnancy in 1997, after the second of two ultrasounds by as many doctors. “Your baby boy is doing fine. Come back in two weeks,” the second doctor said. But both statements presented problems: First, she’d been told earlier that she was having a girl and, after weeks of fantasizing, had even picked out a name. Oishi suddenly remembered a moment during the first procedure when the doctor—a rather senior gentleman whose license no doubt predated ultrasound technology—had fumbled with a book that fell to the floor during the exam. Oishi got a peek at the title: Ultrasound for Beginners. Second, she realized that she couldn’t make it back to the hospital in two weeks for the next checkup. A McKinsey project she was working on required her to be in Osaka that day. “The doctor said, ‘OK, if you can’t make it on Tuesday you’ll have to change doctors.’ Then she threw the chart at me,” Oishi recalls. 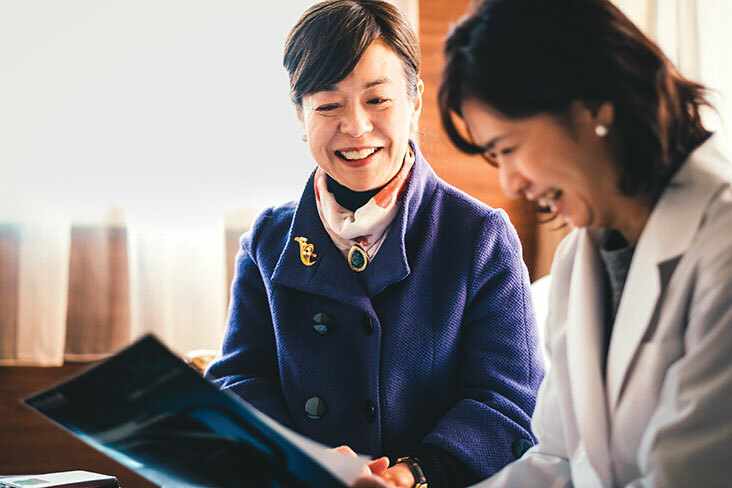 As head of the consumer goods practice—the second woman to make partner in McKinsey’s Japan office—Oishi was accustomed to high stress situations. She had participated in negotiations with tough-as-nails CEOs and landed major clients like Nike and Coca-Cola. “But when the doctor threw the chart at me, I was about to cry,” she says. She grew up in Osaka, a merchant city, where her father, grandfather, and great-grandfather all ran businesses. Even as a child, she always assumed she would too. It was a revelation. Oishi had shepherded ailing corporate clients through inventory problems and dire financial crises—and whatever the symptom, the root cause was usually that the company had lost touch with its customers. “It’s one of the main reasons the country continues to fall behind,” she says. Her job was to go in, determine what the customer wanted, and translate that insight into products and a business. This is what the health care industry was lacking, she realized: a system designed from the patient’s point of view. It would be better for patients and medical staff, “and it could be a nice business,” she reasoned. But before her fateful visit to the hospital, Oishi had little exposure to the medical field. She grew up in Osaka, a merchant city, where her father, grandfather, and great-grandfather all ran businesses. Even as a child, she always assumed she would too. So to make this one work, she would need more data. After a monthlong maternity leave, Oishi approached McKinsey colleague Sonosuke Kadonaga, an MIT alum and partner in the health care practice, and asked if she could join his group while continuing to lead her own. For the next two years—one foot in consumer goods, the other in health care—Oishi gathered data. She interviewed doctors. She questioned patients. She wrestled with the genesis of the country’s predicament and the political obstacles in the way of reform—information that served her clients but also readied her for her own launch. Then she left. Satoshi Nomaguchi was a deeply frustrated neurosurgeon when he first met Oishi in 2000. “She had ideas to change the system, and her thinking was different,” he recalls. Oishi led Nomaguchi and two other doctors in brainstorming a picture of the ideal medical practice, one that incorporated the best of what was available and all that was lacking. Their vision looked much like what we call family medicine today. “We didn’t know about that concept at the time, but we thought people needed that kind of doctor,” Nomaguchi says. They named the company Platanus, after the tree under which Hippocrates taught the art of medicine; Oishi founded the for-profit consulting arm, Mediva (for Medical Innovation and Value-Added). The medical branch remains a legally separate nonprofit, according to Japanese regulation, but in practice the two entities operate as one: Mediva handles management across both companies, for example, freeing the physicians to focus on the practice of medicine. In 2000, Platanus opened the Yoga Urban Clinic. They logged 47 visitors on opening day, many of them supportive friends and family. Day two: 17 patients. Even as the numbers sank far below their break-even goal of 60, the Platanus team wasn’t taken aback. They had built something novel. At the time, most physicians graduated from the overworked hospital setting to a solo practice with hours that allowed for a leisurely morning and a long lunch. The Yoga clinic, by contrast, was open from 8 a.m. to 8 p.m., with three physicians per shift covering a range of specialties. Other clinics were painted stark white and were inhospitable down to the dirty slippers that patients traded for their shoes at the door. The reception area of the Yoga clinic had all the comforts of a wellappointed hotel lobby: plush couches, orchids, artistic lighting, and heaps of toys. Its on-site capacity included everything from X-rays to endoscopy, and a pharmacy where a person could fill a prescription before heading home—with a printed copy of their electronic medical record in hand. Back in the early internet days of 2000, these offerings were unthinkable. The national medical association put up stiff resistance to the clinic, claiming that medical records were the property of the doctor, and that a patient had no right to access them. Other doctors advised against the idea, too, saying Platanus would open itself up to malpractice. Even early market research was pessimistic, Oishi says. But she was listening above all to the voices of patients—and her data. In time it worked. Instead of a liability, sharing medical records with patients proved to be an asset. Patients often file suit when doctors try to hide something, Oishi found, and going to court is a patient’s only recourse. The Yoga clinic’s transparency helped establish trust with the community, reduced its risk of malpractice claims, and became the basis of the business. Now the clinic averages 180 patients a day (twice that during flu season), which represents 30 to 40 percent of the market share in Tokyo’s western Setagaya ward. Just as importantly, the clinic succeeded as an experimental lab, a place to pilot new ideas incubated within Mediva. From that one neighborhood clinic a much bigger business took shape, all focused on the organizing principles of patient-centered design and innovation. Those principles have driven the company’s expansion into women’s health and a host of programs for the elderly population, from nursing and rehab programs to palliative home care—each pioneering new approaches to age-old challenges. On the Mediva side, the consulting practice provides a range of for-profit services, from hospital turnarounds to policy implementation and consumer product development. And its international unit has been busy exporting services to countries such as China, Russia, and Saudi Arabia. Mediva and Platanus apply the principles of patient-centered design—techniques Oishi honed as a partner at McKinsey—to pilot solutions for Japan’s unique set of health care needs. The 660 employees between Mediva and Platanus operate within a flat organizational structure, one of many ways in which Oishi breaks the mold of traditional leadership in Japan. It’s also impossible not to notice that she is quite petite, just over five feet tall, a figure all the more surprising given the force of her presence. It may help explain why, when crowding into the back of a taxi, Oishi insists on occupying the uncomfortable middle seat, letting junior employees fill in on either side. But it also speaks to the spirit of equality that infuses the company. Oishi wants employees to feel like they’ve landed on an island, she says, “and everyone should have their own vision of the city they want to build on it.” She entertains any idea with compelling answers to the questions: What does this do for the patient, and how is it innovative? “She can be aggressive about pursuing anything interesting, even if it falls outside the usual business domain,” says Mediva Senior Consultant Dai Kiuchi. As an example, he learned about a 25-year research effort by the Dementia Services Development Centre (DSDC) in Scotland to develop interior design principles specific to dementia care. With more than 5 million people suffering from dementia in Japan, Oishi dispatched Kiuchi, plus a doctor and nurse from Platanus, to go meet with the group and report back. That exploration resulted in the construction of two facilities in Tokyo—the first outside the UK to receive a “gold” award from the DSDC—where every design detail, from textures to finishes, takes into account the specific needs of a person with dementia. Bathroom doors are painted a high contrast school-bus yellow, for instance, and labeled by name and by icon to accommodate different kinds of visual impairments. Doors that lead to dangers, such as exits, are painted the same white as the walls, so they disappear from view. By supporting independence and removing triggers, the physical environment reduces anxiety and preserves a person’s dignity—all of which can translate into fewer medical needs, Kiuchi says. As with many of Mediva’s innovations, the government is taking notice of the successes, citing them in conferences and papers, and finding ways to build on these solutions in communities across Japan. From the very beginning, as with the Yoga clinic’s foray into electronic medical records, the government has supported the company’s initiatives with grants—a way of looking to Mediva to light the path ahead. And bit by bit, it’s working. The family practice model that Dr. Nomaguchi and his cofounders envisioned has taken hold across the country. Seeing the win-win of reduced costs and improved care, the government recognized it as a specialty in 2015 and vowed to support the momentum with further training. And the community-based home health care model piloted by the Matsubara clinic—where clinics work in groups, share doctors across night and weekend shifts, and employ technology to support the patient experience—has proven to be a valuable alternative to expensive hospital care. Doctors Umeda and Nomaguchi say more and more of their generational peers are transitioning to an increasingly holistic view of patient care; and the next generation is taking up the cause too. To help build momentum among young physicians, Oishi has hired a cadre of them to split their time across Platanus and Mediva, to practice medicine and consult with clients, bridging technology with a patient-­centered approach. And perhaps the most telling sign of success is that today more and more clinics resemble the Platanus models, both in the range of services on offer and in appearance: Just about every new clinic that opens in Japan now adopts the customer-centric design elements first piloted in the Yoga Urban Clinic, Oishi says, and 80 percent have ditched the dirty slippers. Many of the physicians on staff split their time between the practice of medicine and consulting, which allows the next generation to help improve the system from within. By contrast, Oishi has taken any number of risks along the way, beginning with her first job. According to Japanese tradition, the most promising graduates vie for openings at the most prestigious companies, readying for a lifetime of loyalty and the long, straight march of “salaryman” security. 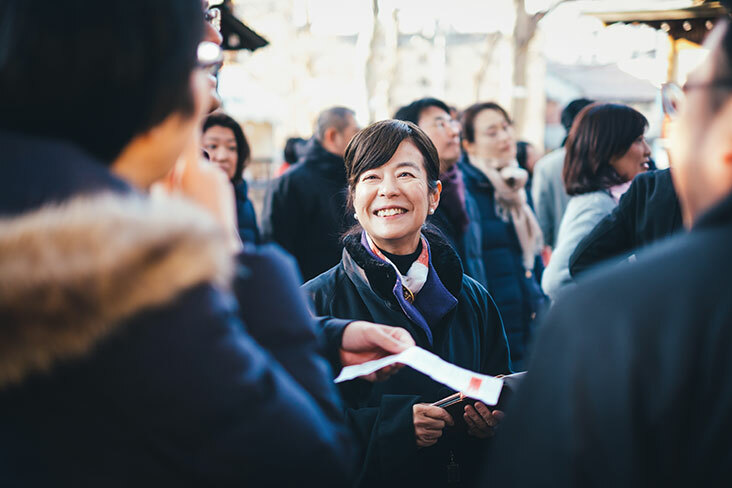 After graduating as valedictorian of her class at Osaka University in 1983, Oishi was one of 200 new hires at Nippon Life, 196 of whom were men. She landed the job shortly before an equal opportunity law went into effect—an experiment, she says, to see how women could be integrated into the ranks of management material. Among other duties, her job description required her to arrive at the office 30 minutes ahead of her male colleagues to prepare tea and wipe down their desks, in uniform. She found more space to roam in the product development department, where both her early tenure and her gender meant that no one followed her closely. 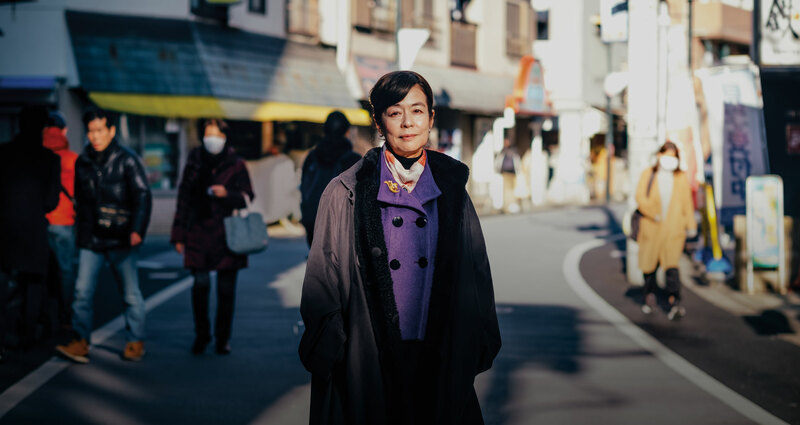 “I would knock on doors and say, ‘Would you be interested in talking with Nippon Life?’ ” She targeted fitness clubs and nursing homes, given the direction of the country’s demographics. Any new business Oishi brought on was passed along to a more senior male colleague to manage. After three years up against the glass ceiling, she left to attend HBS. At a time when few people in Japan were familiar with the concept of business school, it’s hard to overstate the chance she was taking: putting her mother’s money and her own reputation on the line in a country where almost nothing matters more. The work was so hard, she wasn’t sure she would make it at first, she says, recalling a marketing professor who cold-called her to open a case she had not read. She faked it well enough, but the experience helped shape Oishi’s approach to life. “This is real life, things happen, and you have to be on your feet. And if you deal with it confidently enough, you can survive it,” she says. That confidence goes far, particularly as a woman in Japan, where so few make it to leadership roles or even stay in the workforce. (Japan ranks among the lowest of developed nations for women’s participation in the workforce, according to a 2017 report by the World Economic Forum.) As with everything she does, Oishi sees the challenge as an opportunity. Doctors are a competitive bunch, she points out. If she were a man, storming into the Ministry of Health flashing an Osaka-HBS-McKinsey pedigree and big ideas about how to change the system, “They would be thinking, ‘Am I better than this guy?’ Because I’m a woman, I’m not that threatening,” she says. In the same sense, she turns being petite into an advantage too. Plus, there’s the fact that she comes from a long line of business owners in Osaka, a legacy evident in her “Osaka-ben” dialect. For centuries, merchants from the city have spoken the regional dialect known for its disarming charms. “It’s soft on purpose because it makes it much easier to win a negotiation without the other party feeling that there is a negotiation going on,” she says. Regardless of her delivery, Oishi’s path has been paved with naysayers, people who said she couldn’t be a maverick in the industry. But she always believed that, in spite of the pushback, deep down people really wanted to see change. The skeptics just needed a chance to see that good ideas could take hold. The goal of her work has been to see what happens if she throws a stone in a pond: “It’s not going to make grand waves,” Oishi says. “But if we keep throwing stones, then maybe we can get somewhere.” Introducing progress not with a big splash, perhaps, but a ripple. Japan's elderly population is the fastest growing of the OECD nations, but which country comes a close second? Germany. Learn how Global Age Watch ranks different countries in terms of income security, health status, capability and enabling environment in support of their elderly populations. eBaker, the research portal for HBS Alumni, provides access to the ABI database where you can find EIU country reports that include historical, current and forecast data for related economic and demographic data at the country level.